Tired of scouring Delta faucet reviews looking for their best touch faucet? (“Touch” is not to be confused with touchless.) We at Faucet Mag feel your pain. Lucky for you, we have done all of the research and sifted through to fish out the features, pros, and cons that matter most. Let’s start by going over Delta’s Touch2O Technology. These faucets are all electronic and therefore fall under Delta’s five-year warranty. The downside is that all the models listed below require batteries. For some, this may be a deal-breaker, but with the projected battery life (or even the optional adapter), it’s not too bad. All of these faucets are also pull-down faucets. The Delta Leland faucet has a beautiful teapot design that flaunts its curves and also got into our list for top-rated faucets. 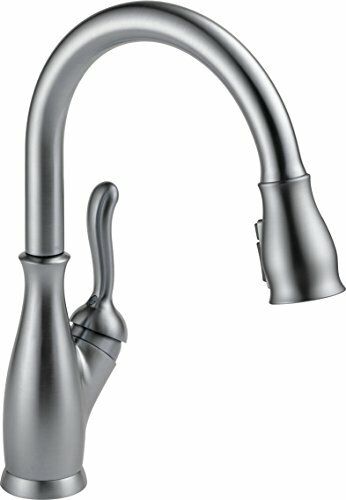 The Delta Leland faucet with Touch2O Technology is well built, with a beautiful design. It is tall and accommodating, making filling pots and washing dishes a breeze. It also features a pull-down faucet that has a long range. 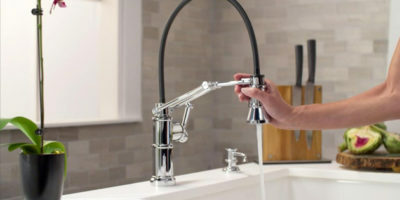 On top of the hose range, this faucet also boasts a nice swivel of 360 degrees that allows you to put the flow exactly where you need it, or to move the faucet completely out of the way when necessary. The one- or three-hole installation makes installing a snap. You can even add on the optional 10-3/4 inch escutcheon that is included in the package. At 1.8 pm and 60psi, you can get the pressure needed to spray off stubborn food without using exasperating amounts of water. (Think Savings on the water bill.) The Touch-Clean spray holes lend saving as well, though not in money, but in time spent attempting to remove hard water build up. 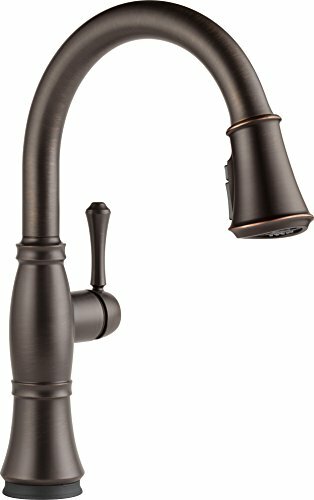 With a price tag a bit smaller than it’s Delta Touch2O cousins, this faucet offers all of the cool features with a healthier bottom line. Included on this model is also the TempSense LED light that is a visual indicator of the temperature. It also shuts off automatically after four minutes. This is handy especially if you have children that tend to forget to shut off the water, and also in case the Touch2O Technology malfunctions and it triggers on itself. The head of the faucet itself extends for some 20 inches to reduce splash. Once you have finished, the MagnaTite technology installed ensures that the head returns to its position each and every time. 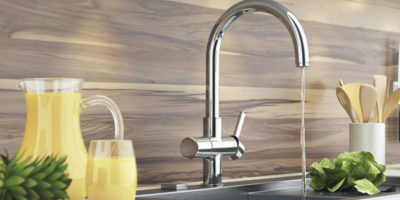 Whilst the extendable head of the faucet does feel a little cheap as it is made of plastic, this faucet performs well and is also somewhat inexpensive. The Delta Trinsic Faucet features a simple yet elegant minimalistic design that would translate well into virtually any kitchen. 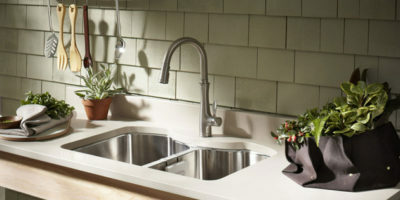 The Delta Trinsic is by far the most versatile designed touch faucet Delta offers. With is minimalistic design, it fits in any décor and is almost guaranteed not to clash in your kitchen. It is easy to install and comes with clear instructions. For those that prefer visual instructions, Delta also offers a handy how-to video. With its 62 inches long hose, the Trinsic offers a very broad reach. The toggle button on the sprayer that controls the flow is well placed, easy to use, and has an audible “click” to ensure proper placement. The MagnaTite Technology is a nice addition too, especially since magnets literally never wear out. This is a huge upgrade over previous pull-down models that had a latch that would wear out over time. Like the Leland, the Trinsic also has the TempSense LED, automatic shut off, and Touch-Clean spray holes. Unlike the Leland, the optional escutcheon is not included and must be ordered separately for three-hole installation. This is a good thing to plan for ahead of time so you don’t open your shiny new faucet to find that you can’t yet install it. For those of us that spend a lot of time in the kitchen, this can be a bummer. As noted on the homepage, the average citizen spends five times more time in the kitchen than in the living room, so I would say that this would be a bummer to most. 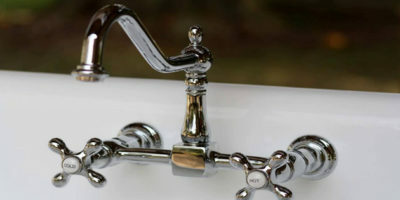 For this faucet, there have also been complaints about water pressure as already mentioned with the Leland, but as stated earlier, these issues can be remedied. The Delta Cassidy was modeled after the Victorian corset, and therefore emanates a sleek design that works especially well with another Victorian décor. The Cassidy is simply beautiful. With over nine inches of clearance, sleek lines, and a noticeable elegance, you are sure to receive compliments on this addition to your kitchen décor. If you need more than beauty, this faucet also boasts the Delta Touch standards such as TempSense, MagnaTite Technology, Touch Clean, and DIAMOND Seal Technology. The Cassidy also has a controlled 1.8 GPM flow that can reach 60 psi. Like all new Delta faucets, it also meets standards set by the Americans with Disabilities Act. In addition to the TempSense LED, there is an on-off indicator light that tells you when your batteries are low, though the battery life for Delta’s touch models ranges from two to five years and is quite adequate. While researching the Cassidy, I came across a good point. One of the features is that when you touch this faucet, it comes on. However, this can also be a disadvantage. If your sink is mid-kitchen, it can be bumped and accidentally turned on. Also, children may see this feature just as fun as a toy. There are solutions to remedy these issues and still enjoy the benefits of the hygiene fostered by being able to turn on your faucet without getting yuck on it. Delta is a brand name that is both well known and reliable with 50 years of providing beautiful and functional faucets and accessories. Their fantastic options that range all styles and prices, and there is a Delta out there for almost anyone. With their wide array of optional accessories, you can customize your kitchen sink in whatever way makes your life easier. Delta also offers coordinating bath fixtures so you can have your favorite design and finish resonate throughout your entire house. Delta also offers cutting-edge technology that can be found in their MagnaTite dock and the DIAMOND Seal. With magnets that never wear out, and nature’s hardest stone protecting the seal, you can always count on your sink to perform as expected. Delta also offers a wide array of finishes, including Chrome, Venetian Bronze, Artic Stainless, and Champagne Bronze. Besides the options in color, there is also the option of Delta’s almost impervious Brilliance finish, that is by far one of the most advanced ways to make a sink stay looking new for years. On top of Delta’s ability to provide almost endless options, they also stack up well in efficiency. In fact, Delta was recognized as the WaterSense Manufacturer Partner of the Year. Although this label only analyzes and applies to showerheads, they have made strides to keep their sinks as efficient as possible as well. Another way Delta shines is through their customer service and warranties. Let’s face it, products can be defective, and technology can malfunction. When you’re in the midst of some disaster such as a broken seal, leak, or even a rogue touch faucet that insists on turning on and off at will, the last thing you want or need is an unpleasant person on the phone when you call for help. Almost as bad is waiting weeks for a replacement, or even finding that you are not covered under warranty. With Delta, an overwhelming number of customer complaints also note fantastic customer service and a quick replacement under warranty. Whether you are looking for the value of the Leland, the superiority of the Pilar, or even the midrange options of the Cassidy and Trinsic, you can receive all of the fantastic features that Delta offers for all Touch models. If you’re more into décor, look to the curvy teapot design of the Leland, the Victorian “waist” of the Cassidy, or the simplistic design of the Trinsic. For a more “organic” look, the Pilar is a clear option. Whatever your needs and desires for your kitchen, I hope that my research and compilation of Delta faucet reviews have found you one step closer to finding which Delta touch faucet is the best fit for you. Thanks for the real information about different faucets in your site but i like the DELTA CASSIDY WITH TOUCH2O. Its affordable and it’s in my budget. I’m thinking of purchasing it in the next Monday. So if you wanna add little more to help me, please feel free….